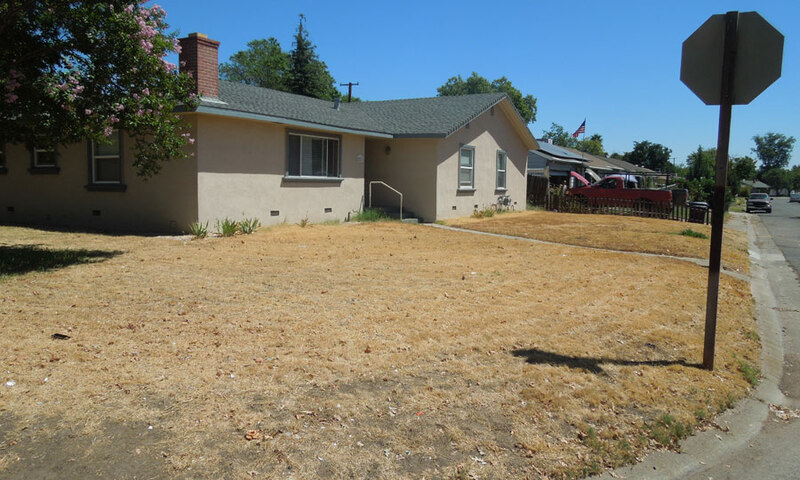 California is suffering through a drought this year, and around Sacramento, some lawns are going brown. Not all lawns though. Some lawns are healthy and green. 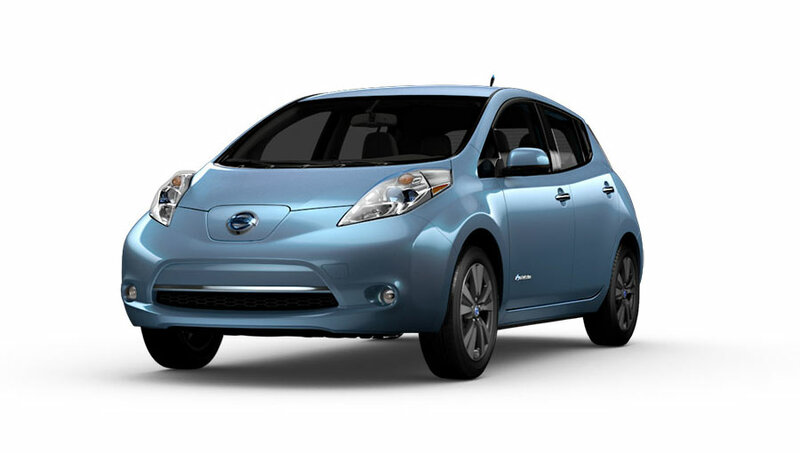 As a homeowner and socially-conscious citizen, I have tried to figure out what kind of motivations people have based on the color of their lawns. 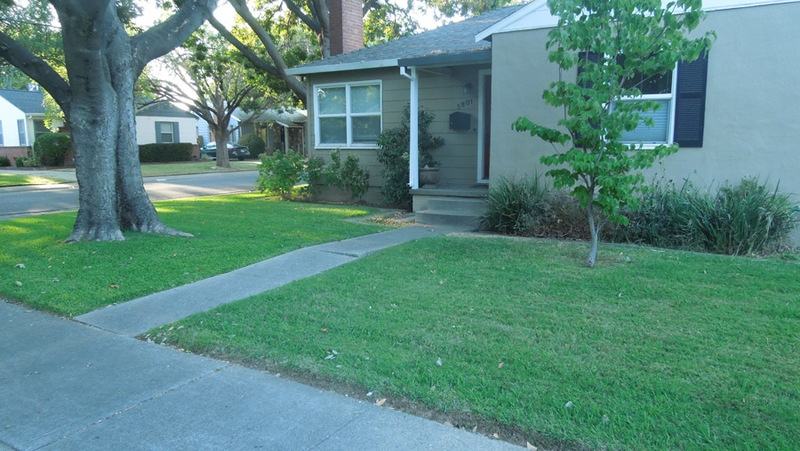 Last weekend I drove around taking pictures of brown and green lawns in different neighborhoods of Sacramento. 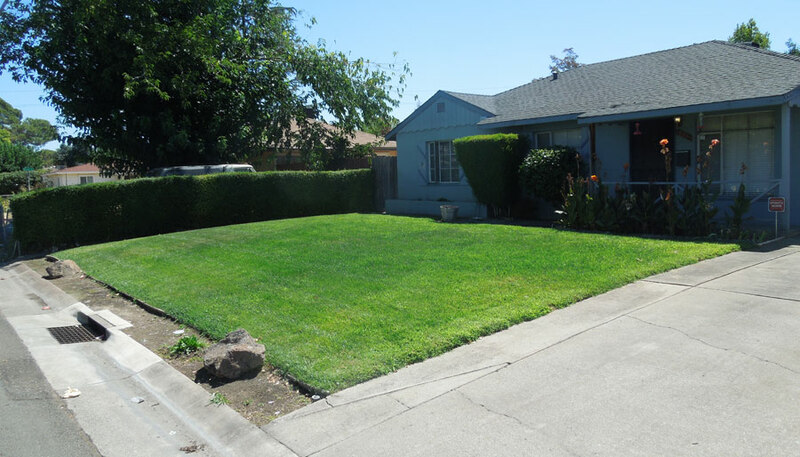 I'll give you a spoiler: Every neighborhood had both brown and green lawns. The three photos above are from a nice section of town called the American River Parkway. There were both brown and green lawns. I assume everyone living there has a sprinkler system installed, and can afford the water. 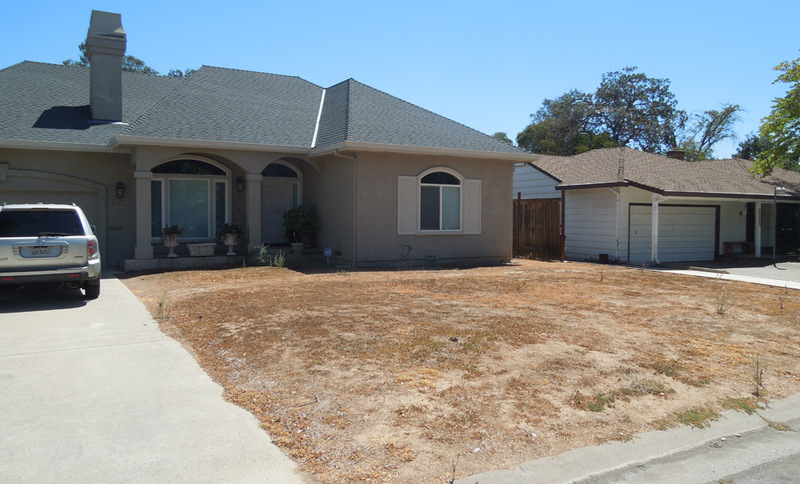 Some people preferred to let their lawns die to conserve water. I was surprised to catch the guy above watering his lawn, but then I realized that he doesn't actually have a lawn. He's got a fenced front yard fronted by a strip of drought-resistant plants. It looks great! 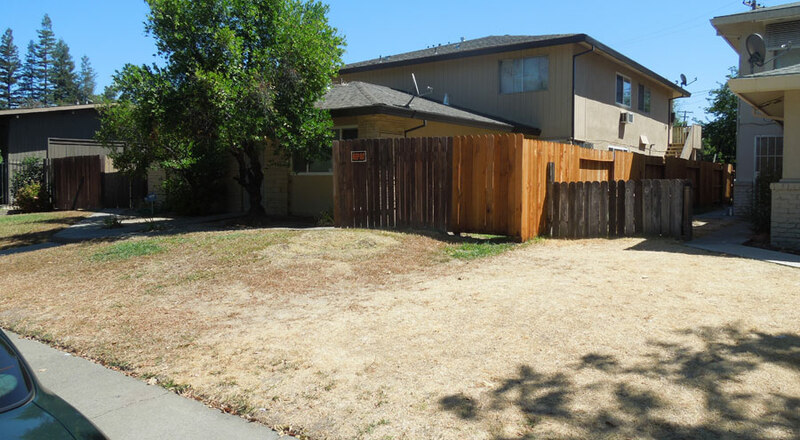 Not far from the American River Parkway is another neighborhood which is poorer, near Amherst Place in Arden. 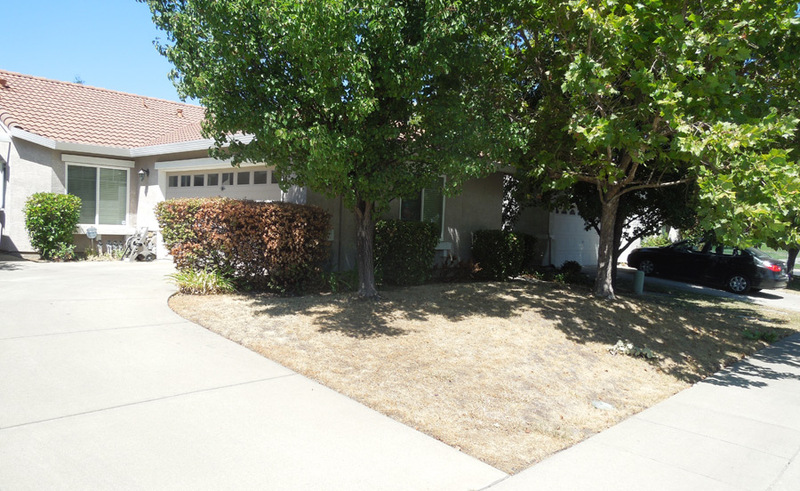 Some of the homes had brown lawns here. I think this is a duplex. And in the same neighborhood, there were plenty of vibrant green lawns. 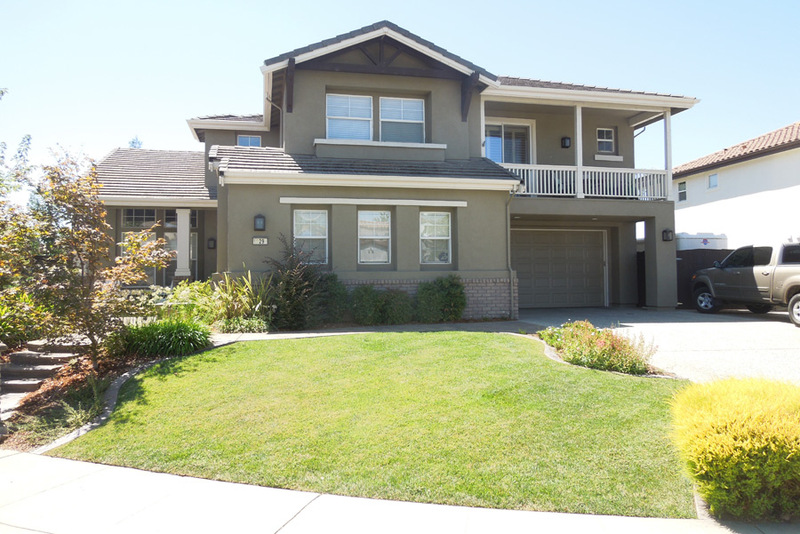 Here's a home in a nice area, Arden Park. They are letting their lawn die. This lawn is so dead it is almost dirt! 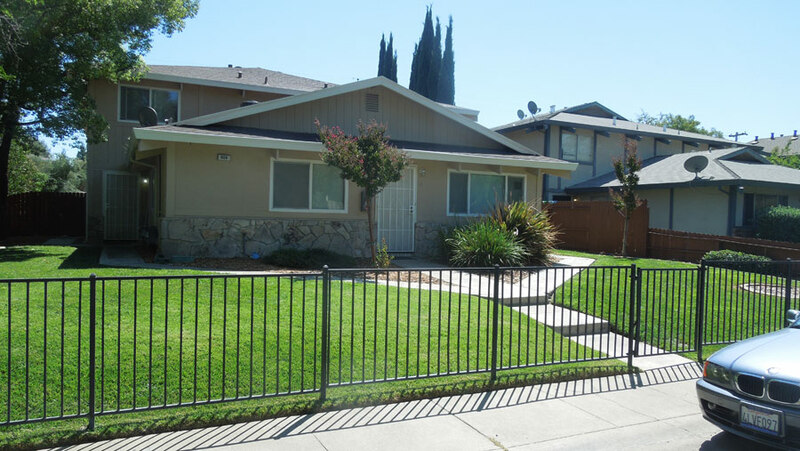 Across the street in Arden Park is this home, with a beautiful green lawn. This house is in the north part of Arden Arcade, a medium-income part of town. 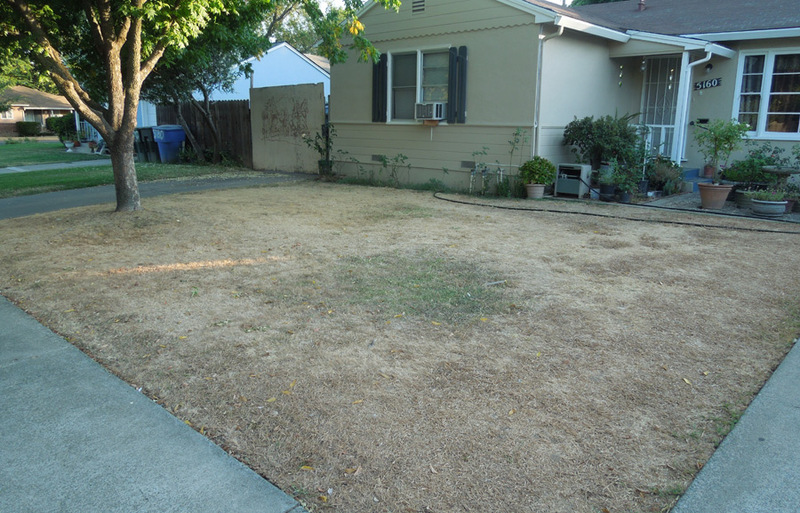 This is an example of a brown lawn. 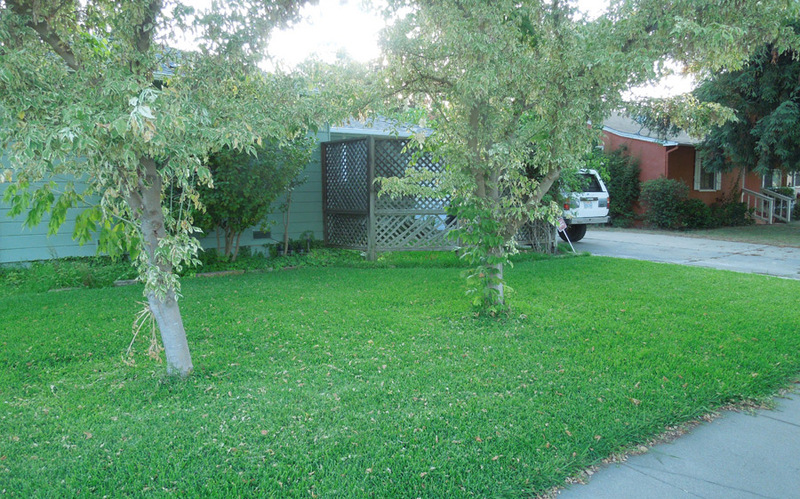 Here's a lawn which is thriving, bright green and a little overgrown. The sprinklers were on when I took this photo. 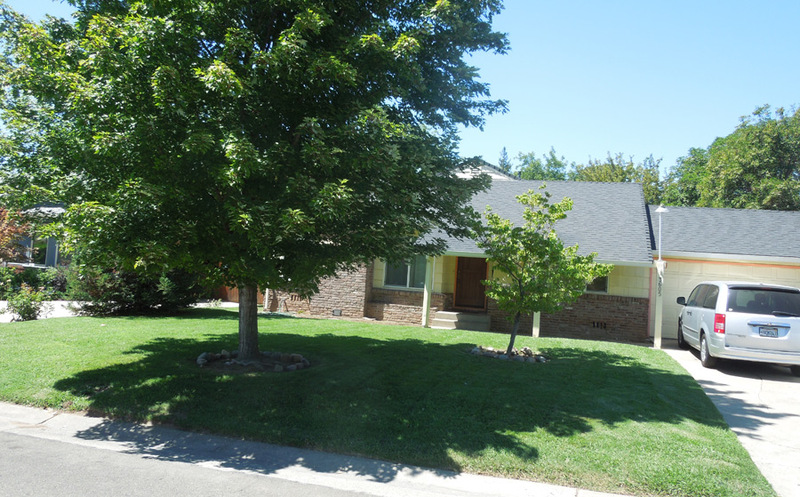 Here's another one in that neighborhood, just as green but well kept. Here's an example in a nice part of town, actually in the neighboring town of Folsom, where I work. The lawn of this house is long dead. Same neighborhood, different lawn. 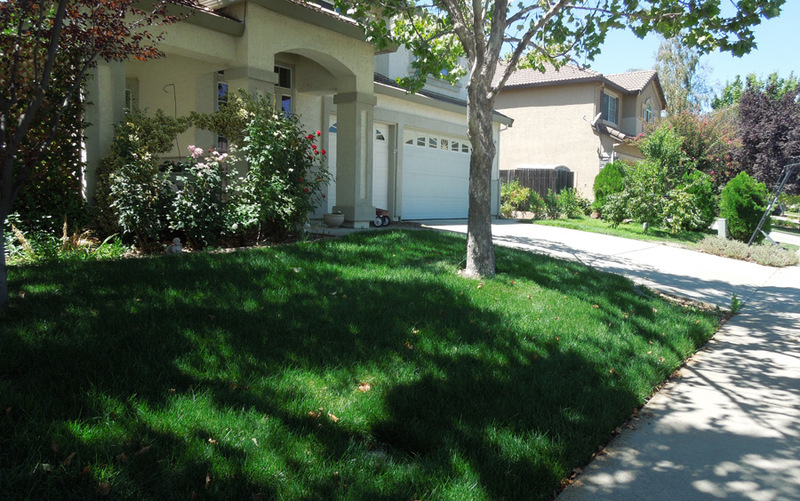 This lawn appeared to be very soft and dark green. I saw one lawn which was so moist that it had mushrooms growing among the grass. If you have mushrooms growing in your lawn, buddy, you are watering too much. 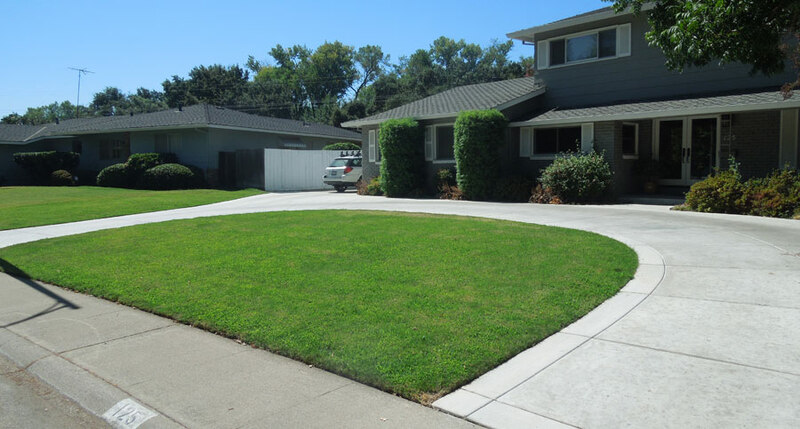 Here's another green lawn in Folsom, in front of a cool house. 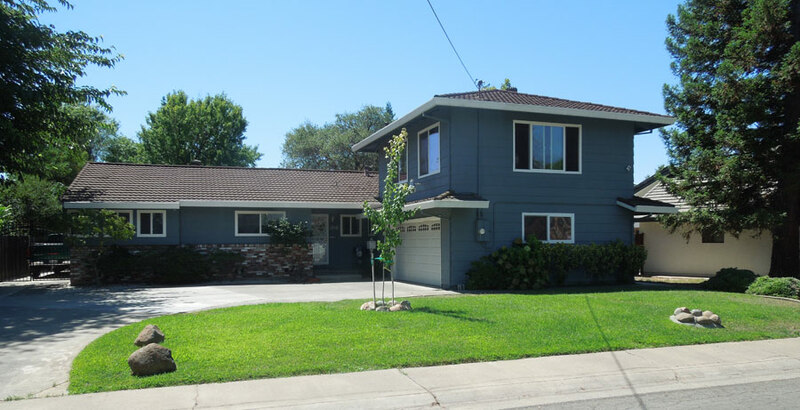 This house is from a crummy neighborhood in North Sacramento. It's got a competely brown lawn. Same crummy neighborhood, rich, green lawn. 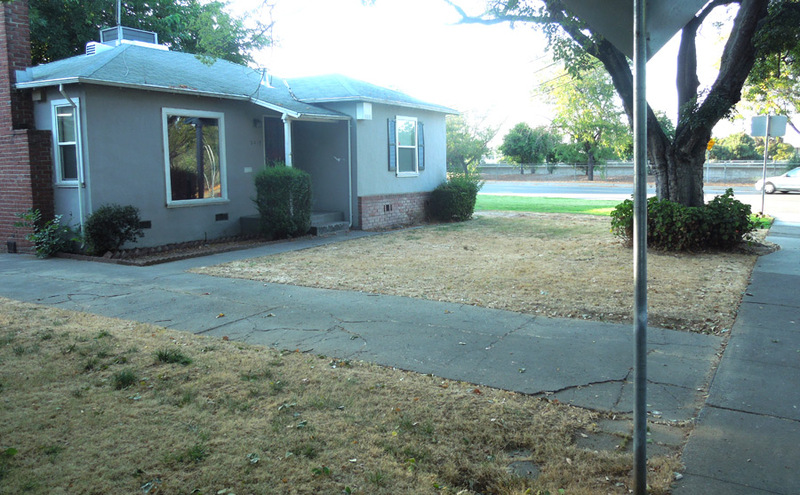 Finally I have some examples of lawns in South Sacramento. The one above is very close to dead. 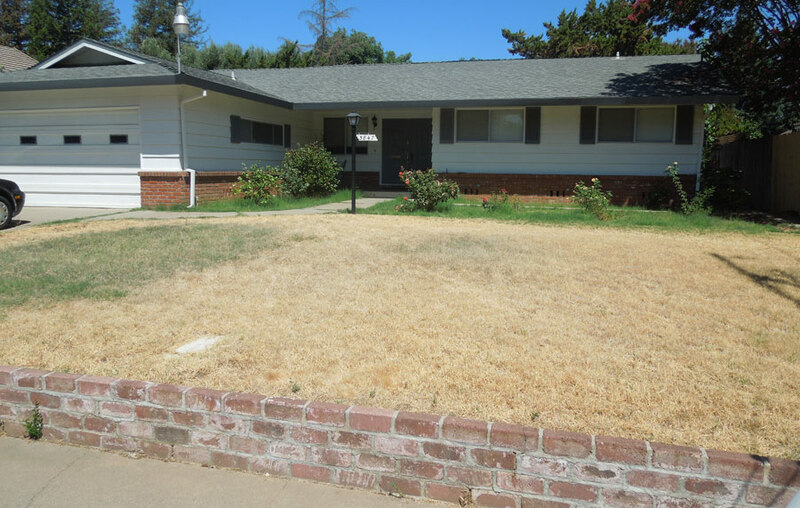 This dead lawn was punctuated with divots for sprinkler heads. They had a sprinkler system, they just weren't using it. On the same street, some houses had green lawns. This one looked healthy. This lawn was thriving. Every inch of the yard was bright green with vegetable growth. 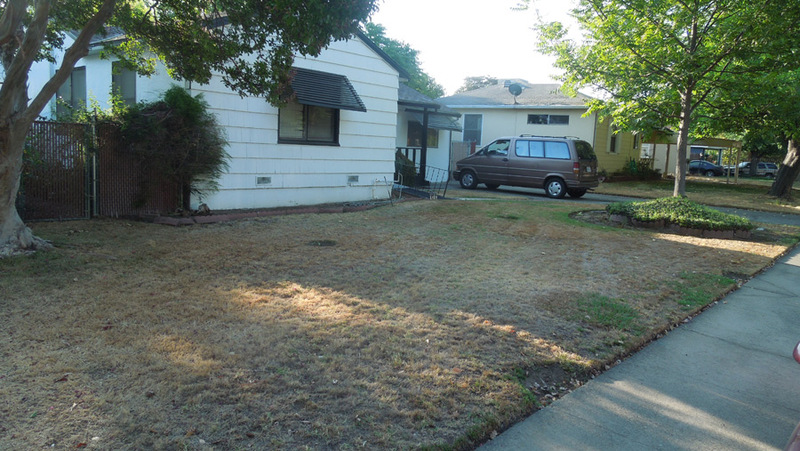 In every neighborhood I visited, rich and poor, good and bad, I found examples of both green lawns and brown lawns. In previous years, a tidy green lawn has been a badge of honor, showing your dedication to maintaining an attractive neighborhood. 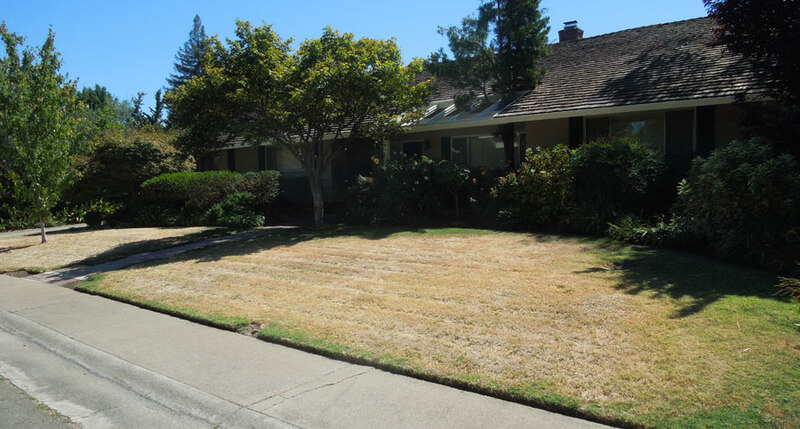 In the drought, a brown lawn might indicate a dedication to help the cause, to conserve water for agriculture, industry and the future. 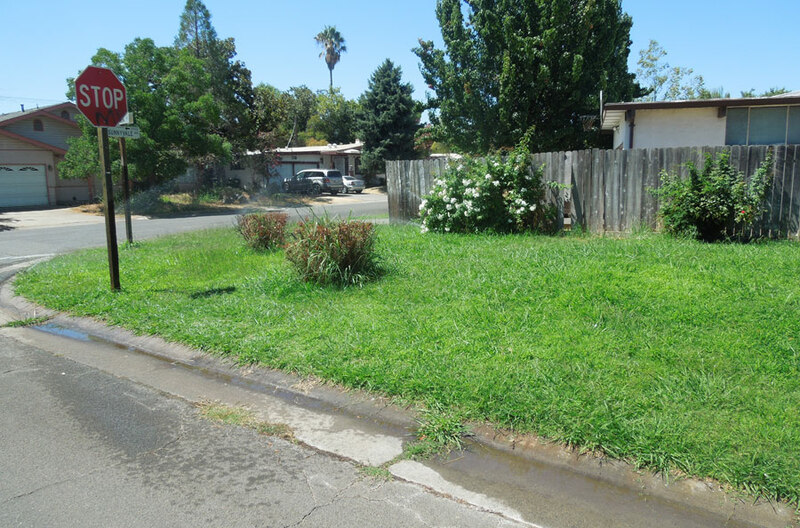 Green lawns mindset: This is an important use of water. An unwillingness to ruin the landscaping. An unwillingness to adjust sprinkler settings. A need to keep the house attractive. Brown lawns mindset: This is not an important use of water. A willingness to ruin the landscaping. A desire to serve the needs of the (state) community. A need to save money on the water bill. An unwillingness to drag a hose and sprinkler onto the lawn, or a desire to avoid mowing the lawn.